Synopsis: Alex Kosmitoras’s life has never been easy. The only other student who will talk to him is the school bully, his parents are dead-broke and insanely overprotective, and to complicate matters even more, he's blind. Just when he thinks he'll never have a shot at a normal life, a new girl from India moves into town. Simmi is smart, nice, and actually wants to be friends with Alex. Plus she smells like an Almond Joy bar. Yes, sophomore year might not be so bad after all. Farsighted is a refreshingly unique story. It’s not often that we see YA tales told from the perspective of a male. Nor do we frequently see stories representing people with disabilities, or people of varied ethnic backgrounds. Farsighted had all those things, and more. It was interesting to read a book from a teenage boy’s perspective, and to have that teenage boy not be the stereotypical combination of popular, horndog, and/or jock. Alex is blind, and is fairly well-adjusted; he’s always been blind, so he doesn’t know anything different. One of the nice things about a YA book from the male perspective is that it was a pleasant break from the catty mean girl drama you get in a lot of books with a high school setting. Alex is bullied by one boy in particular, but it’s realistic - not over the top like some novels - and it doesn’t consume the entire story. Simmi was my favorite character. She was patient, kind, and understanding, even when Alex didn’t necessarily deserve it. She was completely her own person, and didn’t need anyone else to tell her who she should be. She was exactly what Alex needed, when he needed it, and I enjoyed watching their friendship blossom...and wondering if something more was going to happen between them. I also loved learning more about Indian culture through Simmi’s character. As for the actual storytelling, I felt like I could see everything Alex is ‘seeing’ as he describes things with all his senses. We get to see Alex and his friends growing as people, learning sometimes-frightening things about themselves and the people around them, and learning to deal with those things. There’s a fantastic blending of real-life problems with paranormal problems, woven together to make a story that's both believable and relatable. This book has a bit of everything – paranormal, romance, mystery, some action, and suspense. I can’t wait to read the next one! I’ve mentioned Emlyn Chand quite a bit over the last few weeks on the blog. If you’d like to see other posts where she’s mentioned, check the tags at the bottom of this post and click on her name. THE CASH PRIZES: Guess what? You could win a $100 Amazon gift card as part of this special blog tour! All you have to do is leave a comment below regarding this post, and you’ll be entered into the raffle. I could win $100 too if you'd be kind enough to vote for Ramblings of a Daydreamer in the traffic-breaker poll. To cast your vote, visit the official Farsighted blog tour page and scroll all the way to the bottom. Thank you for your help! THE GIVEAWAYS: Win 1 of 10 autographed copies of Farsighted before its paperback release on November 24th by entering the giveaway on GoodReads. Perhaps you’d like an autographed postcard from the author; you can request one on her site. Mind if I ask one more favor (pretty please)? Would you cross-post this review to Amazon and GoodReads to help up Farsighted’s visibility? I <3 you! I thought you might like that Em! 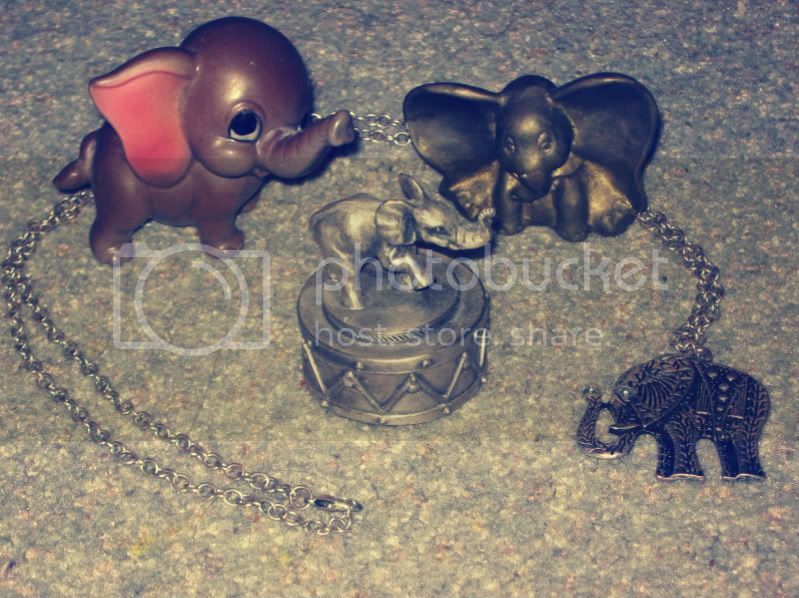 ;-) The collection was my Grama's, and when she died a few months ago, I got most of her elephants...dozens and dozens of them! It put a big smile on my face when I read that Simmi had an elephant collection...it felt like a sign from my Grama, which was fitting considering what Farsighted is about! I have to say i'm 'Team Shapri' though...lol. I enjoyed your review. I was very impressed by how well Emlyn wrote Alex. It's hard enough to write a convincing character, let alone a teenage boy!